Designer round chain with Goddess Lakshmi engraved triangular Blue Pendant having adjustable link chain. This gorgeous neck piece will definitely be a treasured inclusion in every woman's jewellery collection. You can pair it with any ethnic wear in any occasion. Chettinad Matte Ball Chain Lakshmi Peacock Pendant Set. Appealing reddish antique gold plated synthetic Ruby Emerald stones studded Lakshmi with Peacocks engraved Pendant in an MC Ball chain with matching Lakshmi Pearl hanging Jhumkas. 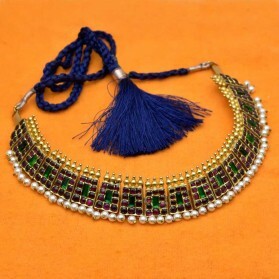 Team this ethnic jewellery with any ethnic wear for Party, Weddings or Engagement functions. Suitable for all age women. Antique Mahalakshmi Pendant with matching ear studs. It,s best suited for traditional and ethnic wear. 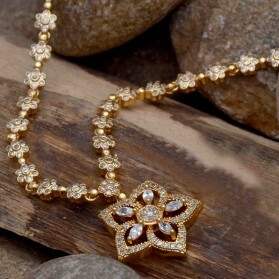 Designer round net chain with flower engraved Diamond cut Pendant. This Beautiful necklace have matching Diamond cut Ear Studs. It is best suited for Teenagers and ladies for Parties, Weddings and Engagement functions. Alluring Semi Precious Stones Sun Pendant Set. 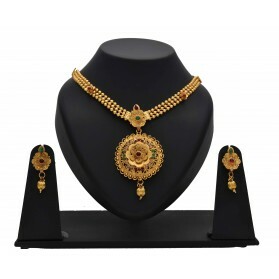 Premium gold plated American diamond round pendant set adorned with Ruby and Emerald stones. This latest trendy pendant set is perfect for any festive occasions, it will add a splash of colour to usual clothes. 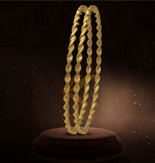 Adorable Kerala traditional Pathakkam means large pendant in a designer chain is used as the first or second necklace in bridal jewellery. 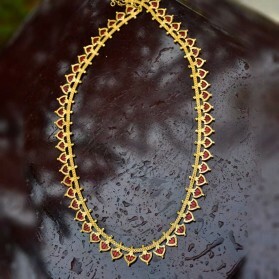 Big designer pendant has a red round enamel at center and synthetic CZ stones on top. It will give a classic touch to your beauty on festive occasions and Marriages. 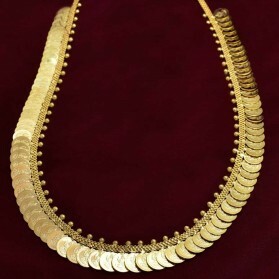 Mind blowing Kerala traditional Palakka necklace with adjustable back link chain. Big Green Palakka Pendant in a round designer chain enhanced with MC balls add its beauty. This gorgeous neck piece will definitely be a treasured inclusion in every woman's jewellery collection. Team it with any ethnic wear for Party, Weddings or Engagement functions.